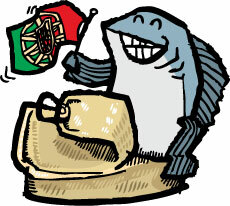 Portuguese Tinned Mackerel for sale. Buy online at Zingerman's Mail Order. Gourmet Gifts. Food Gifts. From northern Portugal, these firm, perfect fillets of mackerel come plain in olive oil or, the way I’ve been enjoying them, in olive oil spiked with Piri Piri, the famous red pepper of Portugal. The taste is somewhere between the sweetness of tuna and the richness of sardines. It’s rare to find tinned mackerel of this quality.